Encouraging reading for enjoyment is one of the most crucial areas of the school librarian’s work, whether in primary or secondary. This is a day-to-day activity, but it is also supplemented by special events like Author visits. Books are bought which will appeal to young people and displayed prominently to attract their attention. The librarian ensures that there are books for all levels of competence, from the most basic to the most advanced, and makes recommendations to individual students. Programmes such as Accelerated Reader may be used to encourage reading progress. Some librarians run reading groups where students can discuss books they are reading or have read. 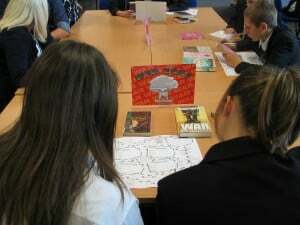 There are games such as the Reading Game, originally devised by a school librarian and published by Carel Press, which encourage students to focus on particular titles and discuss them, widening their acquaintance with a variety of titles and genres. In schools which run DEAR schemes(Drop Everything and Read) the library provides the material for students to do it. The library is a place where students can make independent choices about what to read and a space in which to do it. The librarian may also run book awards and book based competitions in conjunction with neighbouring schools, and take outstanding readers to the KidsLitQuiz heats that take place around the country.